Author: Hans Peter Hahn. Series edited by: Herrmann Jungraithmayr, Norbert Cyffer. 12 pp. Roman, 432 pp. In the anthropological discussion, the term “material culture” includes the utensils and tools of a society as well as forms of house building and settlement. The comparative examination of different manufacturing processes and the utilization of material things allows to draw conclusions from the social and religious living together of the respective group. The present thesis analyses different aspects of material culture, taking into account different scientific sub-disciplines like cultural ecology, semiotics and historio-cultural anthropology. 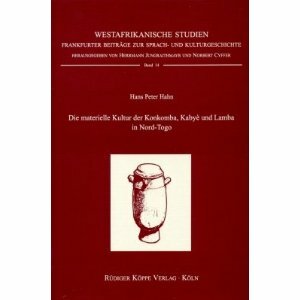 The author compares objects within the areas settlement and house building, pottery, wood carving, basket and mat weaving, smithery, clothing and jewelry and musical instruments, confronting three Westafrican ethnies (Konkomba, Kabyè und Lamba). In each ethnic group about 300 objects were analysed and documented with numerous illustrations to point out the regional differences of the material culture of these ethnies which are each represented with its language and history, tillage and the general living conditions. A glossary contains the most important terms of the African languages with its German translations. Diesem Buch kann man nur eine weite Verbreitung wünschen. Die Aufmerksamkeit der Museumsethnologen dürfte ihm sicher sein – und nicht nur als Nachschlagewerk, sondern auch als Anregung für künftige vergleichende Studien, denn Hahn hat ein sehr brauchbares Konzept entwickelt.